Tutorials 1-8 below are from my invited Advanced Imaging Conference 2010 (AIC2010) workshop, entitled “The ABCs of Image Processing”. They are intended for beginner to intermediate levels. Most of the work is done in CCDStack and Photoshop. You can click the play button in the lower left corner to play each video in place.� Due to size, these are 640 x 480 videos and will be a bit blurry if you enlarge them to fill the page. Tutorial 9 for tri-color narrowband image processing is from invited talks at NEAF and the Chiefland Star Party in 2009.� It covers the versatile method of clipping layer masks in Photoshop to process H-a, OIII and SII data using the Hubble Color Palette for color mapping.� This method was taught at the first Advanced Imaging Conference in 2004 (AIC2004) by Dr. Travis Rector of the U. of Alaska, who has processed many Hubble images, as well as other data taken from professional observatories. Following Tutorial 9 is a link to a preprint of the “In Perfect Focus” article in Sky and Telescope in 2010, including additional information that did not make it into the publication.� This article provides the equation that shows you how much focus tolerance that you have in your system before you need to refocus for sharp stars. combine high-resolution unbinned luminance with lower resolution binned chrominance for beautiful colored images using Photoshop. How to measure the weighting for your system with your red, green and blue colored filters for correct “sun-like” star colors using MaximDL. The following is a link to a G2V star database for Software Bisque’s TheSky6. Please refer to TheSky6 documentation to add this database. You can hide it or display it in Display Explorer in TheSky. (continued from above) covering the creation of your RGB chrominance master frame using those G2V weights, deconvolution of luminance data, DDP to bring out faint areas and saving a 16-bit TIF file for processing in Photoshop. Uses CCDStack. This covers the sharpening of the luminance layer using a fine (~8 pixel) high pass filter for fine structures such as dust lanes in galaxies, and a coarse (~40 pixel) high pass filter for larger structures, like spiral arms to achieve a 3D effect. Each filter is done on a separate layer with a hide-all layer mask, so that only the data to be sharpened is “painted in”. This covers enhancing the color saturation in your RGB combined image in Photoshop, blending the enhanced RGB layer with the high-resolution luminance layer, and then adding a duplicate of the RGB layer in soft-light blending more to bring out color even more. The tutorial concludes with cropping, downsizing and saving in Adobe 1998 for print and sRGB for posting to the web. This tutorial covers common problems in astrophotographs and how to fix them, including reducing background color noise, reducing halos around bright stars and fixing elongated stars. This tutorial continues from Part 1 and covers gradient removal, making stars smaller and fixing irregular stars. This tutorial completes the segments extracted from the “ABCs of Image Processing” workshop. he versatility of this method comes from the ability to go back any time in the process and change the hue, saturation or intensity of the mapped color for each narrowband data. NOTE: Make sure that you convert your 16-bit TIF master narrowband files from GRAYSCALE to RGB mode prior to colorizing and creating the clipping mask with hue/saturation adjustment layer. 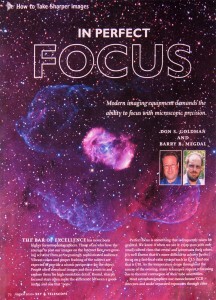 This was submitted and published in an abbreviated format in Sky and Telescope entitled “In Perfect Focus”, August 2010, page 72 (with Dr. B. Megdal). Click here to view the Adobe Acrobat preprint of the article in your browser window. It explains why the conventional Critical Focus Zone (CFZ) is too large to get precisely focused stars, and that a new derivation using David Suiter’s book guided by data from the freeware program, Aberrator, provides more accurate, but much smaller values. For f/10/, f/7, f/5 and f/3.5 optical systems at 500 nm (green), these new CFZ values become ~ 40, 20, 10 and 5 microns in one direction, respectively. These values are incredibly small! A human hair is 50 microns thick to provide some perspective. 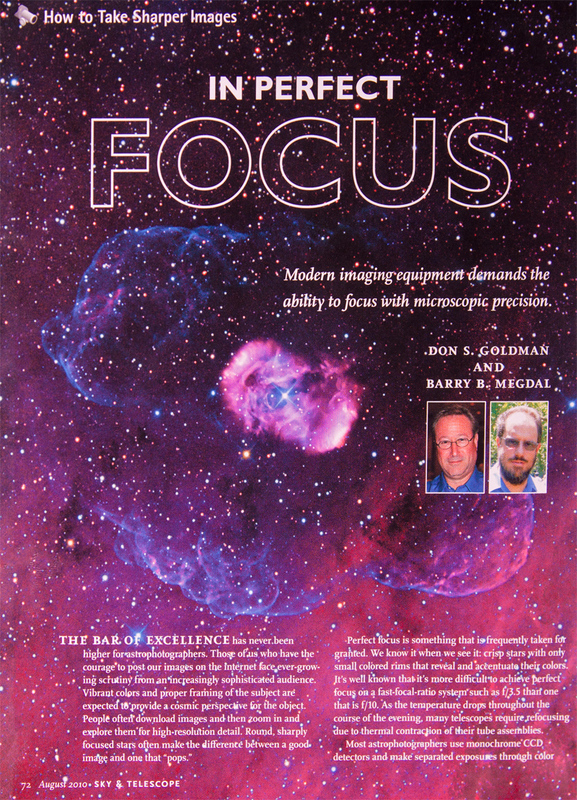 Using a high-precision electronic focuser becomes essential for optimum focus. Remember to save your work as you go, so if problems arise, you do not have to go back to the beginning. Remember to use layers for modifications that can be easily deleted or blended into the original layer. Remember that astrophotography is a rewarding, but technically demanding hobby. You never stop learning new techniques to bring out color and detail in your images. Remember that we are generally not doing science in astrophotography…�we are producing “technical art”. Remember that processing help is just a click away on the internet, such as the many astrophotography Yahoo Technical Groups. And, remember to have FUN… this is a HOBBY! I hope that you found the tutorials useful and informative. Please use the email link above and email comments regarding what you liked, did not like or would like to see. Thanks for looking and Clear Skies to all.